Sorry in advance to make a whole new thread for just this little dab of info but I didn't see where else to put it. If there's a thread I missed where it would be better suited, feel free to move it. A 14 minute video of which only the first 6.5 minutes are of interest (to me). Guy found an old book with pictures (Neuer Atlas Uber Die Gantze Welt by Johann Baptist Homann). He zooms in on the 1715 painting/drawing to reveal a technique I've never seen or even heard of before. The picture itself, at first glance, is pretty typical of medieval artwork-just a portrait-nothing to make one suspect anything out of the ordinary for the times. Until he zooms in. There are no brush strokes. Every detail (and it's very detailed) are just lines; the shadows, the designs, the background, the drapes and clothing, the face, all of it are either straight lines or concentric circles. It reminds me of those modern pictures that when you zoom in are individual pixels of a bunch of faces that, altogether, comprise the main face of the picture. How long would something like this have taken? Surely, the picture subject didn't pose for this. What art schools were in existence that taught this highly skilled method? How in the world did anyone ever figure out how to do something like that without the aid of computer graphics? I have got to start zooming in on more pictures. Seriously, I felt like Leuwenhook when first he looked at a drop of water with his highly polished glass and discovered "wee beasties". Who would ever have thought to even look? What could there possibly be to see out of the ordinary? Maybe some of the more artistically inclined on the site could tell me if this technique is as mind-blowing as it seems to me or if this is "old hat" art technique that's apparently been around since at least 1715. I think Leonardo da Vinci’s paintings also have no brush strokes. It gets even more weird, the thickness of the paint layers does nor deviate, and stays constant throughout. Really? I had no idea. That sounds almost computer generated! I have to admit that some of the paintings?/drawings? I've seen from the 1700-1800's look like photographs. Not being artistically inclined myself, I just can't imagine that kind of talent or what technique could be utilized to achieve it. Screen printing would be the likely candidate, mesh silk screens hold ink within the weave, and when a hard flat sharp edged tool such as a ruler or squeegee is combed over the top a fine layer of ink is left behind. The thickness of his layers was like 2 picometers, which is insane. What grinder did they use for the paint powder? I’m not even sure we can do it today. Don Pettit would probably paint that in a nanosecond! Basically what we have is that something happened at the end of the 17th Century which made painting start in a very primitive way with Pastell water colors. Then in the 19th (!) century with the invention and wide scale production of oil colors the church or others were able to take the old pictures and redraw them, copy them, and destroy the old ones, in the way they liked, creating more or less convincing forgeries. I think it was probably way more difficult to forge the paintings and images, in contrast to the books, so the former happened in a later time. So the story they went with is inventing some kind of single lone geniuses like Da Vinci, attributing unrelated works to him, in an effort to explain why there was so much knowledge floating around. The thickness of his layers was like 2 picometers, whichbis insane. What grinder did they use for the paint powder? I’m not even sure we can do it today. The first inks were made up from fruit or vegetable juices, protective secretions from cephalopods such as squid, cuttlefish, and octopus.. blood from some types of shellfish and tannin from galls, nuts, or bark from trees. They were using man made ink in Egypt about 4,500 years ago and it was made from animal or vegetable charcoal (lampblack) mixed with glue. I believe quite a lot of the pigments required for certain colours would be rather rare and fetched a hefty price, such as Lapis Lazuli. Mineral pigments (red ochre, yellow ochre, umber, lime white) continued to be used by painters throughout the Middle Ages. Dug right out of the earth and shaped into sticks with knives, painters made chalks ready for drawing. Natural red chalks, with their rich, warm color, were popular from about 1500 to 1900. Such artists as Michelangelo, Rembrandt, and Antoine Watteau used this medium to produce some of the most revered drawings in the world today. Available since antiquity, medieval Italian painters used green earth for under painting flesh tones. Its commonly used synonym is Verona green, from Verona, a city in the north part of Italy. Malachiteand verdigris were also used as greens. Orpiment continued to be used for yellow together with yellow ochre. In addition to azurite, which had been used as a blue since the time of the ancient Egyptians, by far the most important blue in the Middle Ages was ultramarine. During the Renaissance, the color blue was associated with purity, and ultramarine was used to striking effect in paintings of the Virgin Mary, where she was almost invariably depicted wearing ultramarine blue garments. The high price of the pigment, sourced in Afghanistan, also meant that its use was appropriate in the case of a noble subject such as the mother of Christ. Omgosh they are probably all fakes. I remembered reading quite a bit of art sold is actually fake/replaced. Can’t find that article but the link is an example. Perhaps almost all originals are replaced with really good, some kind of printed, art by now? My first post. Good weekend all. This article I have on laptop, translated from russian source. Let's look at this incredible story gradually and strictly. In any case, the reader at any time will be able to refuse further immersion in the technique of the visual work of the Renaissance. If you feel that there is not clean - set aside, do not read. You can continue to listen with delight and confidence to the nonsense that art critics carry. Europeans are very meticulous people. And once the British artist David Hockney , looking at the drawings of Ingres (19th century), decided to see them under magnification. He was amazed at how realistic these works are. And yet, Hockney noticed a clear resemblance to the works of the contemporary artist Warhol , who projected the photo onto the canvas and depicted it. Hockney decided that Engr used Camera Lucida ( Camera of Lucid ) - a device that is the simplest optical device. 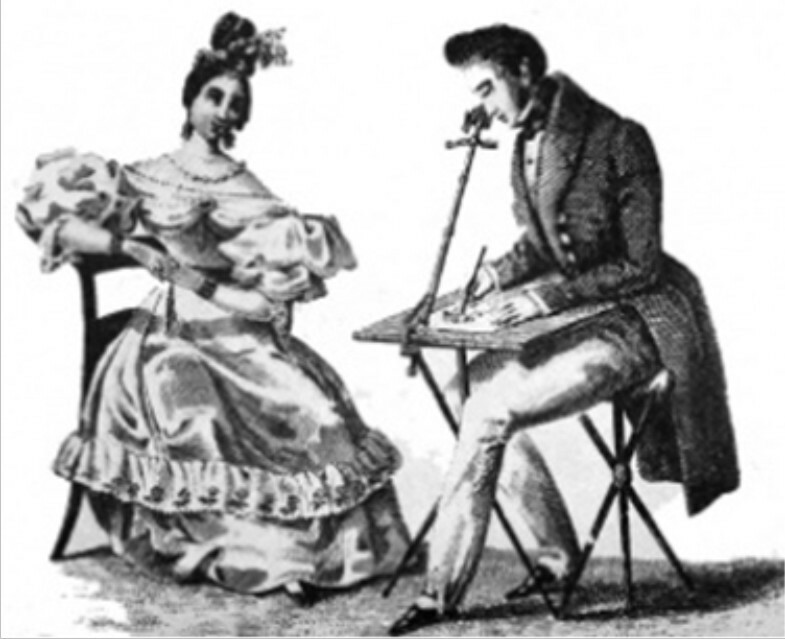 The prism is mounted on the stand to the tablet and the artist, looking at his drawing with one eye, sees the real image, and the other - the actual drawing and his hand. This contributes to realistic images. It occurred to him to try to explore a variety of paintings from different countries and times. This is understandable. Drawing a truly realistic picture is not easy at all. Were artists using all sorts of optical things in ancient times? Here he was waiting for many interesting discoveries. It turned out that the artists of the Renaissance Epoch (14 ... 15th century) painted with such realism that without the use of optics is simply unattainable. 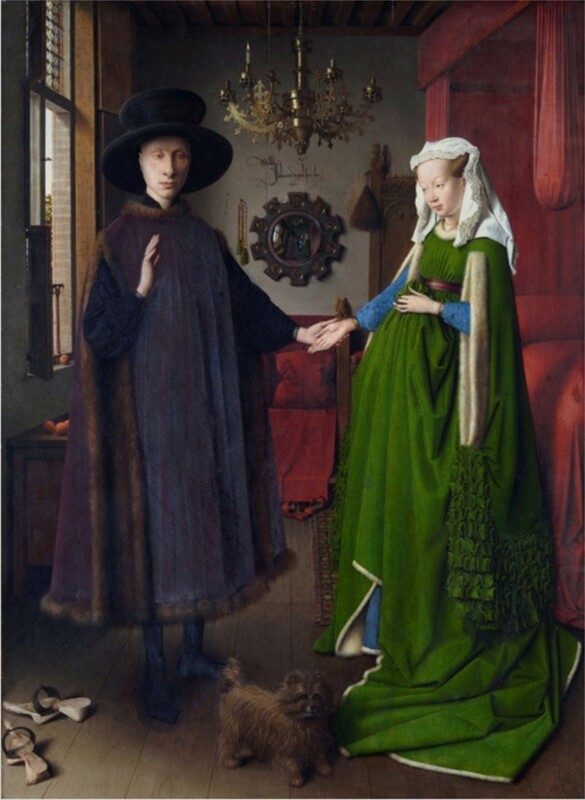 Here is a wonderful example - the picture of Jan Van Eyck, which is called " Portrait of Chet Arnolfini ." 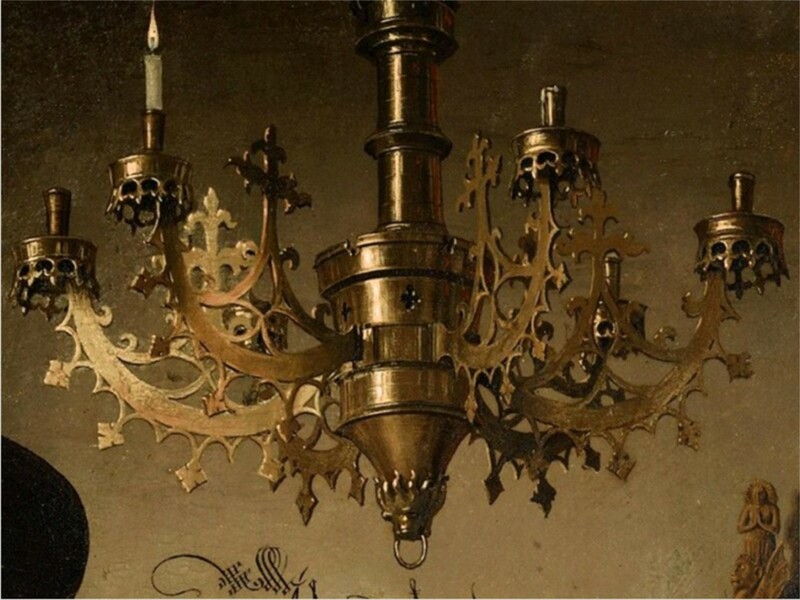 The painting has an image of a metal chandelier-candlestick. To confirm his guess Hockney even ordered a completely identical metal chandelier. It was made and then, having chosen the right source of light, it received exactly the same highlights as in the picture . Why is optics necessary? - the inquisitive reader will ask. Maybe the artist just very carefully and carefully traced what he sees. But the fact of the matter is that the glare on the metal is not just chiaroscuro. It is enough to change the position of the eye of the observer relative to the object by a fraction of a degree, as the highlight disappears. So, in order to achieve a similar result, the Artist had to fix his head in a clamp, and work with a brush at a breakneck pace. After all, the light source is the sun, and it moves. Without this, all the glare does not remember, and not reproduce your imagination. It will be beautiful, but it will not coincide with reality . Once again, we note that these conclusions were made by a professional artist who is familiar with painting not by hearsay. In addition, Hockney noted in many paintings of the time characteristic for the use of optics distortion. 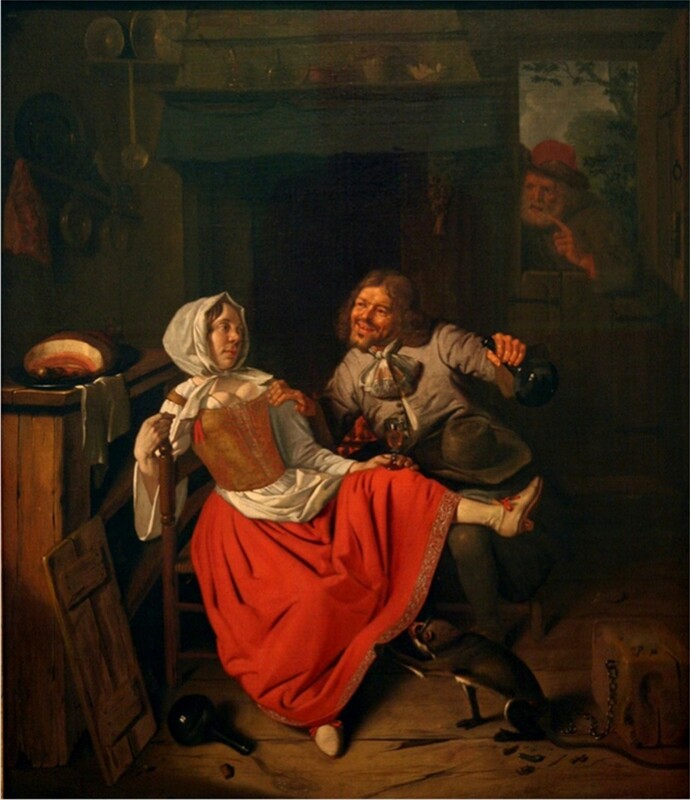 For example, general left-handedness, as in a picture from the Frans Hals Museum (17th century), where a pair of left-handers is dancing, is threatened with a left-handed old man with a finger, and a left-handed monkey peeps under the woman’s dress. This is obtained by drawing the reflected image. If the optics is not perfect, then in the process of projecting the original image, you have to move the canvas to sharpen one or another part of the image. In this case, errors in the proportions. And here is an example : the huge shoulder of “Antea” Parmigianino (circa 1537), the small head of “Lady Genovese” by Antonis Van Dyck (1626), the enormous feet of a peasant in the picture of Georges de La Tour. And finally, the famous effect sfumato . This blurring (not sharpness) of some objects in the picture. For example, the artist managed to project an image onto a canvas with optics quite well. The main thing is to be in focus. In this case, small objects around the edges can be sacrificed and they are drawn in a blurred form . Thus, Hockney irrefutably and professionally proved that some Renaissance artists used optics for the most realistic representation of reality. Simply put, they didn’t draw, but outlined and painted. But it is precisely Leonardo who is credited with the discovery of the sfumato technique . That is, he not only dabbled with optics, but it went with him. However, there is another feature of his paintings, which Hockney did not explore. For example, on the famous masterpiece “ Mona Lisa ” there is not a single brush stroke, and not a single fingerprint. That is, he did not even simply circle and paint, but did it in some unthinkable way. It is necessary to admit that for me there were a revelation of the word of a certain remarkable woman art critic who spoke once on the channel “Culture” in the program “Academy”. She said that today, artists are simply not able to repeat the achievements of the masters of past centuries . It’s impossible to draw them like that - the “ secrets of mastery” are lost. A question was immediately born in the audience: “What about fakes?”. But she said that most often forged only the signatures of famous authors in the paintings of the unknown. BUT! The same time and similar level of skill. 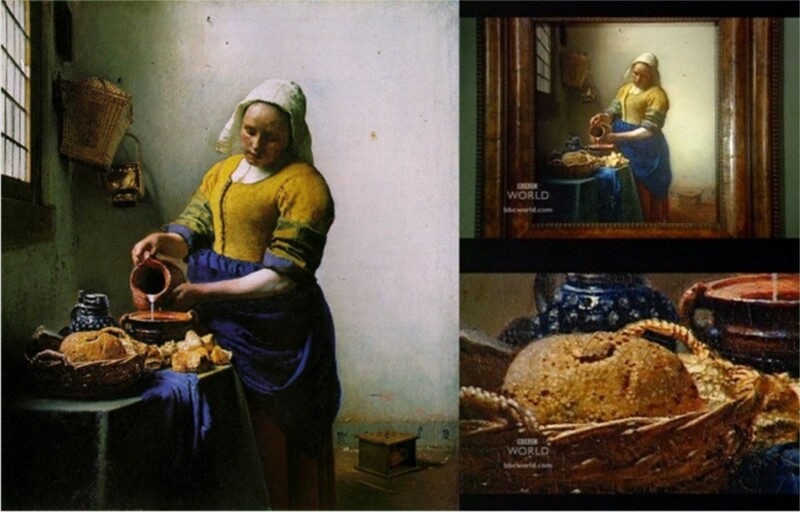 So this is why these paintings are considered priceless masterpieces! They simply can not repeat and do not understand how they are made! And in the case of Leonardo da Vinci technology is generally prohibitive for artistic technology. Therefore, studies of such paintings continue today. “... each layer of glaze has a thickness of 2 microns, which is 50 times thinner than a human hair. In some places of the picture, the total thickness of all layers of glaze is 55 microns, which means that the master repeatedly applied layer by layer to achieve the desired effect ... "And they also said that pigment particles (colored mineral) are so small that they cannot be measured. " in the usual way. " It turns out that if even the pigment was applied so thinly and evenly that its particles would be located exactly in one layer, then they should not be larger than 2 microns (micrometer, μm). Not anymore, but perhaps they are much less. An ordinary person does not have in his mental baggage clear images and concepts of super-large and ultra-small. That kiloparsecs, that micrometers mean little to him for that particular one. This is natural, he does not use them daily. Therefore, it is necessary to describe what a pigment particle is 2 microns in size . Do you think you have met with substances of such smallness in real life? Not usually. The smallest thing you could deal with is talc . From it, for example, make baby powder. The size of the particles of powdered talc has a spread of just 2 to 10 microns . It must be said that absolutely all colors are now made on the basis of pigments. For this, stones are not always used. Sometimes pigments are extracted from plants or even insects, but particles of coloring matter are present invariably. And our master simply did not have another option with its colors. So, even if Leonardo had decided to paint his paintings with talc diluted in a binder, then he would not be able to get a thickness of one paint layer of 2 microns, since a significant portion of particles are larger than this size. But after drying, it is the particle size of the pigment that determines the thickness of the layer. How to get such small particles? Interestingly, talcum powder is used mainly because of the softness of this mineral. It is easiest to grind. For drawing, they always used other minerals that had characteristic colors. But they are all much harder talcum. This means that it is even more difficult to grind them to such fineness. Today they do it in modern mills and reach pigment particle sizes from 15 to 55 microns . This is a massive and fairly cheap production of pigments for oil, alkyd and other similar paints. This size is considered appropriate. On the one hand, the smaller the particles, the better the properties of the paint, on the other the grinding process also takes a lot of time and is associated with various technological difficulties. So it turns out that the current level of mass technology allows us to apply one coat of paint with a thickness of about 30 microns . Well, our cars, painted in several layers, generally have a coating thickness of 80 ... 100 microns . How, then, did his paint Leonardo da Vinci? Completely incomprehensible! Anything that is overwritten (or obtained by other progressive methods) is even smaller, is already called micropowder, and this is the subject of other areas - micro-polishing, optics, science , nanotechnology and typography. “... yellow color shows needle-like, star-shaped precipitates of alpha iron hydroxides, 0.01-10 microns in dimension ... Tabular crystals of iron oxide - hematite (α-Fe 2 O 3 ), dimension 0.05-1 microns ... increase in color (to 10-20 microns) - shifts the shade to the cherry and lilac side ... "
This is already the very smallness that would be useful to our artist for his “sfumato effect”. But among these pigments for printing inks are also used, not all sizes. As a result, it turns out that inks for high and offset printing form a paint layer on the finished print less than 2 microns . How is it that Leonardo da Vinci could technologically outrun our modern chemical plants with its medieval mortar? But all this of course does not perplex art critics and skeptics from science . “So what?” They say. - "He took his mortar and grind more thoroughly." That's why he is a genius, let him try. So I had to figure out what it means to “crush in a mortar carefully”? And what is such a tool capable of? It turns out that there are techniques and guidelines for the grinding process in a mortar. Today this process is preserved in the pharmacy. There is a feature - the finer the active substance is milled, the stronger its effect on the body. Therefore, pharmacists are trying to crush the conscience. But there is a limit to everything. Here the limit is - if you can see the individual particles by eye - work on. And if you have turned out like a completely homogeneous powder, then all - throw a pestle. You no longer have the criterion you must achieve. Then you can poke in the mortar for a whole year - nothing will change visually. Are you bad? Is it good? How many microns reached? Not defined. The technique states that the human eye is able to distinguish individual particles of 70 microns in monochromatic powder.. Therefore, when today pigments are rubbed down to 15 ... 55 microns, they no longer rely on the eye, but apply screening on micro-sieves. So I think that Leonardo’s resolution was 40 times higher than all other people? This is even for a genius brute force. And if we assume that Leonardo da Vinci wove himself a micro-sieve before making his paints, then Mona Lisa herself is no longer surprised. Since there and beyond everything is precision and micro. Too much of the ridiculous and impossible layered on each other. Maybe this picture, like many others of that time, is simply made in a different way? Especially since it fits well with the wording "the secret is lost. " And what else is there to lose as no other manufacturing technology? Brush trimming method? The composition of the rag-grout? Enough of us already probably fool. Modern people are not so stupid that for several centuries of drawing with the same tools and materials (as art critics say) not to repeat the achievements of one person. 5. Or maybe a seal? At first it was impossible (as we found out) to prepare paints in a mortar. Obviously, using his genetically modified eyes, in which a modernized lens of increased transparency complemented the fundus of the eye with a forty-fold increase in the number of photosensitive cones. In such eyes, it would probably be creepy to look at (and it is unlikely that they would fit in the human head), but they provide the necessary resolution of the image to control the production of micropowders in a mortar. Then he applied to the right places in different parts of the picture with “wide strokes” (with borders and transitions not distinguished by the eye) paint of a single tone. Not at the same time in the location and contrast. Apparently, he pre-made layered tracing paper, and complex color schemes, and also used amazing nano brushes, allowing not only to paint the paint exactly in the right place along the contours, but also not to leave traces of the stroke, while adjusting the thickness of the tone. Such a tool would ideally combine the properties of a sprayer and an artistic brush, which no one has yet invented. Then he took a nano-paint of a different tone, and applied it with the next layer to the exact right places. Again over the whole picture and with the desired thickness. And so, about 20 translucent layers, each of which is unique in configuration, are heterogeneous in density, and only when all the layers are superimposed, the final appearance is obtained. At the same time (as we have already determined), Leonardo da Vinci had to make about 20 flawlessly accurate schemes, cripples on each paint layer. Moreover, he could only impose all these layers and check the final result virtually (mentally). Computers, they say, was not there. In such a head that is capable of such speculative operations, perhaps it would have been possible to insert those same modernized eyes. Well done art critics! Dreamers! Against the background of such realities, any fairy tale seems plausible. I can also add that this technology strikingly resembles modern multicolor printing . There, the color image is also decomposed into monochromatic layers. Then they are applied to the paper in layers just less than 2 microns each. Overlaying each other, these layers create a multi-color picture. Only the number of these layers today is from 2 to 6 . A larger number is not justified for modern technology. Difficult and cumbersome. And Leonardo - up to 20 layers . True, color printing already existed during Leonardo da Vinci. So Schaeffer (a student of Gutenberg) in 1457 used colored inks - blue and red - when typing. His Psalter is the earliest known to us a multicolor pattern - in three runs - printing. There, of course, the paints are not the same as today, but still - three layers! However, we must reluctantly recognize that layers of 2 microns and 20-layer , graphically very complex images are an infinitely remote technological perspective for the printing house of that time. So part with our dream of a da Vinci 20-color print shop. Of course, against the background of the official version, you can assume anything - it won't be worse. But ... Somehow it's done? Let's think about it anyway. What we have? 1. The absence of strokes in the paintings of Leonardo and indeed of that time. We are told that the artists carefully rubbed the paint layer. But then, the century in the 18th, completely forgotten how to do it. And today, too, do not know how. 2. The effect of sfumato , that is, the blurring of objects that are not in focus. We are told that this was done in broad strokes and in layers, but by the 18th century they had forgotten how to do this. We are not able to today. 3. Dark tones in the paintings of the time. We are told that this is precisely the result of the application of the sfumato effect. And to view these pictures requires more bright lighting. But what prevented the artists from choosing lighter tones of paints, if they painted it with brushes? By the 18th century with tones from artists everything turned out just right. 4. Extremely realistic, not accessible to human vision and intelligence with traditional techniques of painting. We are told that this is a genius (read genetic modification) of artists of that time. But it is known that ordinary people were trained in this craft (technology). And by the 18th century, again, everything was gone. But they continued to draw. There were art schools. What, talented people are gone? And what does all this lead to? Whether I like it or not, we have to admit that the absence of strokes and prints , plus layering , speak of alternating emulsion on canvas. The fact that optics was used (proved by David Hockney ) indicates the possibility of the image developing directly in the emulsion layers using the photo exposure method. This confirms the amazing origin of colors in the colorful layers. On the one hand: one layer - one color. On the other hand, it is impossible to determine the size of pigment particles by conventional methods. If we assume that each of the solutions of the emulsion gives a different color, then everything becomes clear. This is also confirmed by the dark tones of paintings of that time. They either faded (as a property of the photochemistry of the layers), or it is the inevitability of the color tones available at that time, again, precisely photochemistry . Because the usual bright colors were. The loss of the “ secrets of craftsmanship”, as well as the disappearance of all the described features of painting by the 18th century, speaks of the loss of technology and technology , which makes it possible to produce appropriate photochemistry, put it on a canvas and optically project an image. It is likely that the technology of photo exposure was not lost immediately. Surely its elements were used later in parts, along with the usual methods of painting. For example, the same optics. She did not stop using. And the first elements of photochemistry began to be used again at the beginning of the 19th century. Today, the most important clue to the secrets of Leonardo da Vinci should belong to chemists . After all, the composition and the principle of the manifestation of colors in the thinnest layers of the emulsion could definitively clarify everything. But here my efforts are in vain. I confess, with chemistry I have a hard time True, I bothered to familiarize myself with some of Leonardo's texts on mixing paints, alchemy, etc. It turns out that his views did not just precede modern science, but were, as it were, a little in a different plane. He tied the observed phenomena more to certain general philosophical laws.. On the other hand, he was very practical. It is all the more difficult to imagine this person mixing powders in a mortar for months, with the full understanding that no one will not only appreciate this, but will not even be able to notice. One way or another, but his notes are generally difficult to compare with the conclusions that were made above. But there is one big BUT . We have been fake so many times that we cannot vouch for the authenticity of these texts. You can not be 100% sure that these pictures were painted by Leonardo da Vinci. The only thing I believe in is a threatening shaft of facts, which over and over again stubbornly leads us to conclusions about the developed technological past of our earthly civilization. After all, someone created these pictures, and such as they simply could not appear with medieval technology. And it was not so long ago - the 15th century . Good article, Alabaster. When looking at architecture of the past we get the niggling feeling that there had to be a superior technology in place in order to build those magnificent buildings, but renaissance art should be proof positive that we have lost the knowledge of what we once knew. I found this video very interesting and compelling in terms of where he was going in his thoughts. Sure made me wonder! Some of the questions he brings up are certainly worthy of way more investigation. The picture is in a book. That's how it looks because of the printing process. It looks exactly like modern paper money.